Just finished reading H.W. Brands' Texas history book: Lone Star Nation, The Epic Story of the Battle for Texas Independence. It is very well written, a real page turner. Heroes such as James Bowie, Stephen F. Austin and Davy Crockett jump off the page at you. It is always inspiring to delve into the lives of ordinary folks who achieved great things in the face of major obstacles. 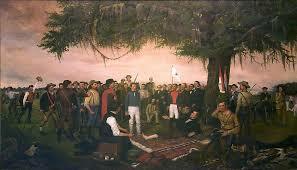 What stirred my soul; however, was the triumph of Sam Houston. Sam Houston was accused of being a drunk. Yes, at times in his life he drank heavily. He resigned as Governor of Tennessee when his brand new bride left him and further embarassed him by divorcing him for another man. He had his share of financial woes and tete at tetes with politicians who disagreed with him. Yet one thing was consistent. He had a big heart for others. Despite being close to President Andrew Jackson, and serving under him in the military, he disagreed with him on how to treat the Indians. Perhaps living with the Cherokees for a time, brought full circle his open minded, cosmopolitan view of life. He always tried to deal with others squarely and in fairness. After his first divorce, he took on an Indian wife but she too left him when she refused to accompany him to Texas. 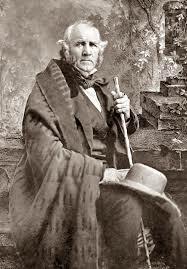 Sam Houston came to Texas in an effort to start anew, explore exciting fresh possibilities on a clean slate. He arrived in time to be elected Commander of the Texas militia as it fought General Santa Anna of Mexico for independence. The makeshift Texas government had no funds. The volunteers became recalcitrant and mutinied in frustration often. Founder of Texas, Stephen F. Austin was not too pleased with Houston's political rising. Yet, despite all the troubles and losses (the Alamo, the battle of Goliad), he pressed forward even when his own men questioned his judgment. Much like South Carolina's Frances Marion (the Swamp Fox of the American Revolution), Houston knew better than to fight a losing battle. He ordered the Alamo be destroyed so that it could not be used against Texans until they could establish a stronghold. His men ignored his orders and a tragedy of great proportion, 'Remember the Alamo', taking the lives of James Bowie and Davy Crockett among other illustrious heroes ensued. Houston's strategy was not to react emotionally but think logically and strategically to better the odds of winning. While his soldiers begged to fight, he scurried north towards the Louisiana border hoping to get the United States to intervene (smart considering the Texas numbers versus the Mexican army). He found ways to deal with rebellious soldiers and refocus their energies on the big battle. He even found a way to pardon a court martialled soldier. He was a man of mercy and forgiveness. He even spared Santa Anna's life (once captured as a prisoner of war, unlike what Santa Anna did to the Texas prisoners of war at the Alamo and battle of Goliad). A most powerful moment in his life occurred when as Texas Governor, the state legislature voted to secede. He had to determine if he would recognize the measure. He requested and was granted one night to make his final decision. Up to this point he had served as Governor of Tennessee, United States Congressman, United States Senator, twice elected President of the Republic of Texas and Governor of Texas. His bravery, honesty, and ability to temper passion with reason alongside his great compassion for others served to bring him such trusted positions of power, of which he never abused. After a long, restless agonizing night torn astrife with both United States loyalties and Texas loyalties, he made the tough choice that he could not support the Texas legislature in seceding. He was promptly relieved of his duties. The difference is Sam Houston never sought power out of avarice, egotism, or greed. He served to do good. May we all do well by remembering the moral strength of character of Sam Houston and do our part in doing right no matter the cost of the circumstances or sacrifices (even judges are threatened in our current system to 'play along' despite the law, facts and doing what is right). It takes a true leader to do what is right, particularly when it costs him or her. Texans can be very proud that we have in our history a leader of gigantic proportions in Sam Houston (perhaps this is why a 70 foot statue exists of Sam Houston on interstate 45 highway in Huntsville, Texas). 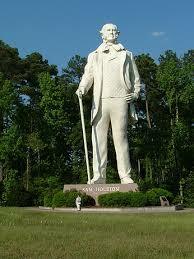 May we all think of Sam Houston in our toughest moments and do what is right and make him proud.